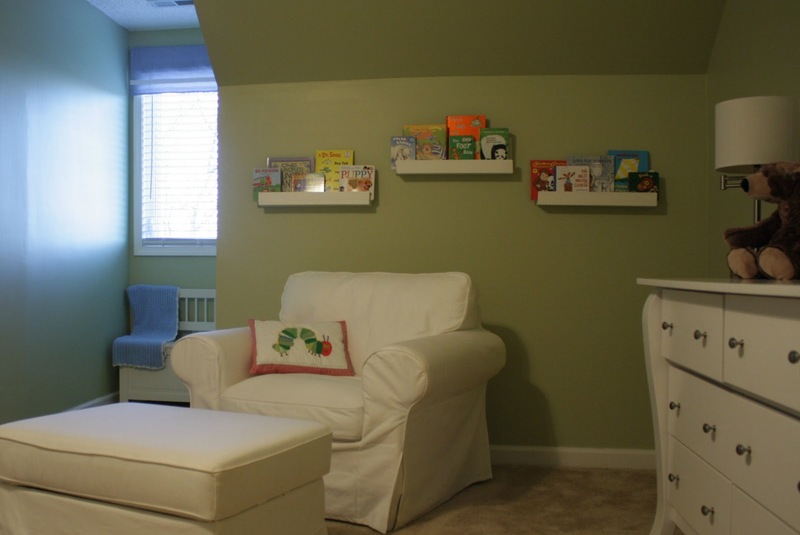 It's been really fun showing you guys Baby Jake's nursery this week! I can't wait until my little fella' gets here and can enjoy it himself. No really. I can't wait. I'm definitely to that point in pregnancy where I'm anxious and excited and so. stinking. uncomfortable. I wish I had a time machine!! But today, I've got one last tutorial from his nursery to share. Did you guys see the book display? J.B. and I whipped these up ourselves. Well, ok, J.B. did most of the work. But hey, I painted! I didn't take a lot of pictures while we were making these because it was pretty simple. We decided to make each display 20 inches long and cut each piece of lumber accordingly. Tip: Apply some wood glue before nailing the pieces together. It really helps. Next just sand the wood down and paint. J.B. actually screwed these directly into the wall. Why not? 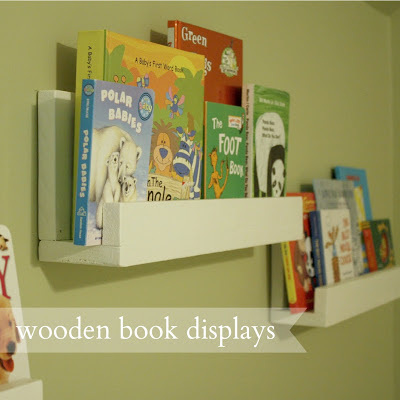 Its the most direct way to attach the display shelves and the books will completely cover the screws. And I'm so grateful to already have my own small library of books for Jake. You guys know that J.B. and I are big readers, so I know he will be too! I can't wait until little man loves to hear these stories himself! !